Most people know that milk is good for their bones, but did you know that it could also be good for your brain? Scientists have found a link between drinking milk and the levels of a naturally-occurring antioxidant called glutathione in the brain in older, healthy adults. In this latest study, 60 participants told the researchers about their diets in the days leading up to brain scans. These scans were used to monitor levels of glutathione, a powerful antioxidant, in the brain. 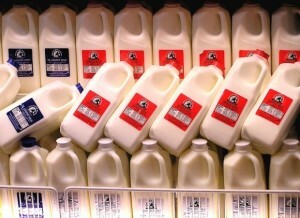 The researchers found that the volunteers who had drunk milk recently had higher levels of glutathione in their brain. Glutathione could actually help stave off oxidative stress and the resulting damage caused by reactive chemical compounds produced during the normal metabolic process in the brain. Oxidative stress is known to be associated with a number of different diseases and conditions, including Alzheimer’s diease. In fact, the researchers found that the closer the participants were at reaching the daily recommended intake of dairy servings, the higher their levels of glutathione. This finding is especially important for older adults, who could make an easy lifestyle change to improve health. “Antioxidants are a built-in defense systems for our body to fight against this damage, and the levels of antioxidants in our brain can be regulated by various factors such as diseases and lifestyle choices,” said In-Young Choi, one of the researchers.